Do you know where you are going with your Agile implementation? | Cape Project Management, Inc.
Do you know where you are going with your Agile implementation? What every executive needs to know! Over the past decade, I've been involved in more than 20 Agile projects. Whether as a team member, Product Owner, Scrum Master, or Coach, I've had the opportunity to play a role in many successful projects. These days, however, I’m being brought in (more and more often) to prevent Agile failures. It isn't so much that the projects themselves are failing, but that organizational impediments are preventing success. Why? Version One’s most recent annual State of Agile Survey found that an “inability to change organizational culture” and “general resistance to change” are the most common reasons Agile projects fail. Most assume that Agile is a developmental change. They see it as a process improvement and treat it as such. I would argue, however, that Agile implementation is actually closer to transformational change. Since most companies don't anticipate this transformation, care isn't taken to manage the impact of the change and the outcome is often failure. Those organizations that do see Agile as transformational are better prepared for the work needed to achieve long-term success. What does it take to have a successful Agile implementation? 1. Is speed to market the main issue? Does the company need to deliver products more frequently? 2. Is the organization inefficient? Does it need to be “leaner” and more efficient with existing resources? 3. Is quality the issue? Does the company need to improve customer satisfaction with the software it delivers? 4. Is the organization new, or is it one that’s trying to reinvent itself and have a more empowered culture? It’s critical to answer these questions before embarking on an Agile implementation. With these answers, the choices become simple. If, for instance, your organization can answer YES to all four questions above, and if you're willing to do what it takes to implement the Agile approach verbatim, then you should consider implementing Scrum and XP (Extreme Programming). These are transformational approaches which focus on team empowerment and cross functional roles. They therefore require re-organization and a dramatic shift in management and leadership style. I recommend using many XP practices when implementing Scrum. 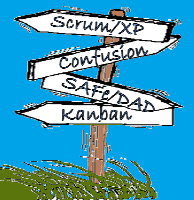 At an Agile New England meeting I attended a few months ago, Ken Schwaber, co-author of the Scrum Guide, stated that the merger of Scrum and XP into a single approach was originally intended. The reason for this is that Scrum doesn't dictate any specific engineering practices. XP addresses key development practices such as pair-programming and continuous integration. Its focus is on high-quality code. Technical Debt is minimized when you follow strict engineering practices. Many of the other Agile approaches make major assumptions about engineering practices already being in place. This is one of the major flaws of many current Agile implementations. If you don’t have a solid set of engineering practices and tools in place beforehand, your implementation will only have a short window of success. On the other hand, if you answered NO to question number four, you should consider a more prescriptive Agile implementation. Approaches like Kanban, Scaled Agile Framework (SAFe), and Disciplined Agile Delivery (DAD) are more conservative and provide a clearer set of requirements and processes that need to be in place for the organization to be successful. I suggest that Kanban can be presented as a developmental change whereas I still consider SAFe and DAD to be transitional changes because they often require a reorganization to align with the approaches. Though I'm thoroughly familiar with Kanban, I only have passing knowledge of enterprise frameworks such as DAD and SAFe. At the enterprise level, my experience is with organizations that create their own Agile/Hybrid methodology, adopting Scrum terms but keeping many of their existing roles and processes in place. This generally creates confusion for the team members who get “certified” in Scrum but aren't actually allowed to implement Scrum as it was intended. If you've read my other blog posts, you know that I’m totally onboard when it comes to adopting a full Agile implementation of Scrum and XP—even though it’s EXTREMELY difficult. The key thing to realize when implementing Agile’s most popular approaches (Scrum, XP, DAD, SAFe, etc.) is that you must embrace the entire approach. If you don’t, you’ll quickly become susceptible to confusion and implementation “fatigue” from team members and stakeholders. The implementation will become a struggle and it will probably fail. In Scott Ambler’s 2013 IT project survey, he finds that 64% of Agile projects are successful while only 49% of traditionally run projects manage to achieve the feat. To me, this isn't an overwhelming improvement given the amount of effort required to implement Agile. It’s hard to decipher whether or not these Agile implementations were well-executed. We only really know that organizations which call themselves Agile are still struggling with 36% of their projects. If you're not willing to embrace cultural change, DON’T DO SCRUM OR XP. Go with Kanban, SAFe, DAD, or an internally developed hybrid instead. If you don't have engineering best practices and support tools, such as automated regression testing and continuous integration, then YOU'RE NOT READY FOR AGILE. Step back and institute these processes first before building a new project management approach on top of a flawed foundation. Dan is a lifelong project manager and trainer with extensive experience in managing software development projects. Based upon his experience, he has adopted both Agile as the primary method for developing and implementing software. He is passionate about the leadership emerging from self-organizing teams. Dan has over 20 years of experience providing world class project management for strategic projects, direct P& L experience managing up to 50 million dollar software development project budgets, experience managing multi-million dollar outsourced software development efforts and strong, demonstrated, results-driven leadership skills including ability to communicate a clear vision, build strong teams, and drive necessary change within organizations. Dan holds a Bachelor of Science majoring in Industrial Engineering from the University of Massachusetts, Amherst and is a Certified Project Management Professional, Professional Scrum Master, PMI Agile Certified Practitioner and Certified Scrum Professional and is the owner of Cape Project Management, Inc.